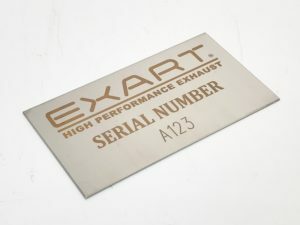 EXART exhaust welds a metal plate with logo mark and serial number to all the products since July 2017. All the serial numbers for domestic and export sales are controlled by EXART as uniform management. Beware of imitations. EXART is proud to be a company which protects and dedicates the Japanese craftsmanship. Once you touch our products, you will certainly know what it means. EXART® is a registered trademark of EXART INC.